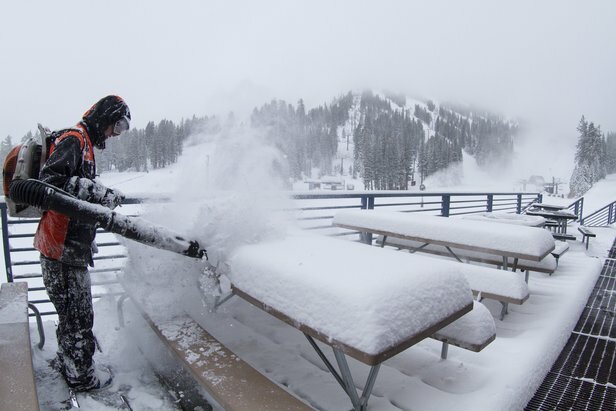 Storms delivered powder at Mt. Rose for its early November opening. We all understand that sliding on snow is a good thing, but how does it get from the clouds to beneath our freshly waxed boards? Everyone it seems always talks about storms, and wind direction, and highways shutting down and stocking up on food, duct tape and toilet paper before a big blizzard, but nobody really talks about how snow is formed. These six steps will help to solidify a snowflakes journey from start to finish. All types of precipitation start out as moisture and we can get it in a number of ways. One example is when wind blows over the ocean or other large bodies of water (like the Great Lakes) and pulls moisture into the air. Another way is when moisture evaporates over large lad areas. (Just because the middle part of the U.S. is far from an ocean or large body of water, it doesn't mean there's no moisture there.) Even plants and other ground vegetation retain moisture, and some of that moisture evaporates as well. When air is lifted, it expands and cools, and this is the beginning of snow. There are many ways to lift moist air. One very powerful force is when wind hits a mountain and is forced to rise up and over the mountains. In other cases, air is lifted by some invisible forces near the center of storms or under the jet stream. These "invisible forces" pop out of very complex physics equations, so we'll hold off on the gory details. This might seem obvious, but it takes cold temperatures to ensure that the moisture in the air turns to snow and not rain. Around the middle to top of the cloud way above your head, air temperatures must be colder than about 15F (-10C) to ensure snowflakes are created. If the temperatures are colder than freezing, but warmer than 15F, sometimes freezing drizzle can form which is just small liquid water drops that fall from the sky and freeze immediately upon contacting a surface (power line, car, road, grass, etc). Oddly enough, snowflakes start as tiny dust particles, which serve as the nucleus (or center) of the snowflake. Dust particles always exist in the air, though there are more particles over land than over the oceans. This is the most important step! Right now, we have moisture in the air and dust particles, and now we need to put them together. The moisture in the air comes in two forms: water vapor, which is an invisible gas, and small liquid water drops that are colder than 32F (but are not frozen). At this point, some of the liquid water drops freeze around the dust particle and at the same time some of the water vapor freezes directly onto the dust particles. And voila - a snow crystal is born! The biggest and best snowflakes are formed when the air in the cloud is about 5F (-15C) and the moisture is very high. Copyright: snowcrystals.com and Kenneth G. Libbrecht. When enough moisture attaches to the dust particle and the ice crystal is big enough, gravity pulls it down out of the cloud and it falls as snow. Of course, this is the recipe for just one snowflake. To whip up a big snowstorm that dumps many inches (or feet!) of snow on a large area, you can imagine that you need to take this recipe and double it up about a zillion times. It takes a ton of snowflakes to drop the powder that most folks want to ski. 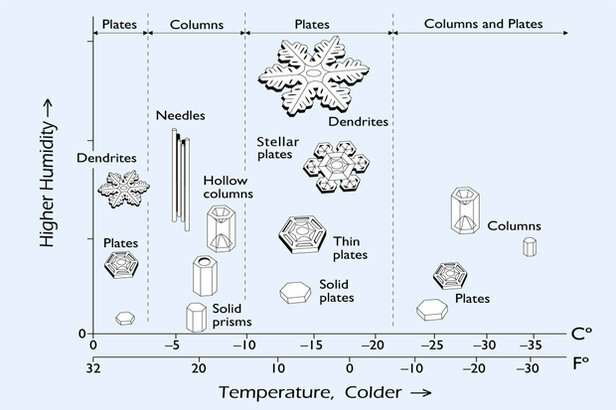 There are many different types of snowflakes and the shape of the flake is generally determined by a) how cold the air is, and b) how much moisture is in the air. The biggest and best snowflakes are formed when the air in the cloud is about 5F (-15C) and the moisture is very high. These flakes are called "dendrites" and are just the fluffiest and most fun flakes around. The size and shape of snowflakes is determined by the temperature of the air and the amount of moisture in the air. The biggest (and best!) snowflakes are formed when the air in the cloud above you is about 5F and there is a ton of moisture.